RTR: Which players do you think performed consistently in 2012? 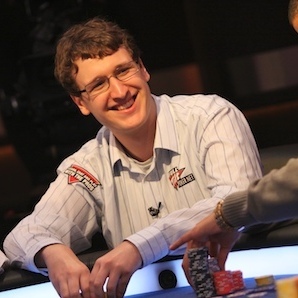 Marvin “Mad Marvin” Rettenmaier – Marvin has always been a great player and is a great person to have around the poker scene; he’s always smiling and telling jokes and that probably hasn’t changed after the year he’s had. He had a reasonably quiet start to the year with a 3rd place in an EPT €10,000 side event for €85,000 but then he exploded. Immediately after switching sponsors from Titan Poker to Party Poker he won the WPT World Championship at the Bellagio conquering a stacked final table, good for $1,196,858. Immediately after that he had a strong showing at the World Series of Poker, earning himself 6 cashes and one final table. It would only be his first tournament after the WSOP where Marvin would win another tournament, World Poker Tour Cyprus, winning back to back WPT’s in a historic first. Dan Smith – Dan has had an incredible year from start to finish. He started it off winning the $100,000 challenge at the Aussie Millions against a stacked field besting 22 players for over a million dollar payday. He would then head to the EPT in Monte Carlo and achieve perhaps one of the most remarkable feats in tournament history, he won three €5,000 events back-to-back. He earned himself over $685,000 and to put it into perspective, assuming everyone in these tournaments was of equal skill (obviously not with Dan Smith in the field) the chances of winning those 3 tournaments is 1 in 1,732,150. This wouldn’t be it for Dan Smith, he once again proved his expertise in navigating the tough high roller fields as he conquered the EPT Barcelona High Roller for just shy of $1.2 million dollars. RTR: Which players have won big tournaments in 2012 and are expected to continue that success into 2013? Max: I’m tipping Steve O Dwyer to have a huge 2013, he had an incredible 2011 with over 1.4 million dollars in tournament earnings and while 2012 hasn’t been as kind to him he’s still up well over half a million. He plays every tour in Europe and a lot of stuff in America and with the volume he puts in combined with his skill he’s bound to hit a big score soon. Kevin Vandermmissen has had a great year, taking down the Irish Open for over half a million dollars. I’ve played with him personally and with his creative nature along with some good old fashioned restraint I think he’ll do really well next year. RTR: Which under-the-radar player will be the biggest surprise? Max: I’m tipping Irish player Jason Tompkins to do big things in 2013, he had a final table this year at the WSOP finishing 6th and he’s always been a thorn in my side on the Irish circuit. He has an Ivey like table demeanour and a very solid game to boot. He hasn’t had any huge scores yet but I think it’s only a matter of time and I just hope the next time we play together in a tournament I’m on his left for a change! RTR: Which big-name pro will be the biggest disappointment? Max: Michael Mizrachi has had another great year in 2012 winning the WSOP players championship for a second time, the first player ever to do so. However his volatile style can easily lead to a bad streak and in the limited amounts of time I’ve played with him I have to say I’ve never been that impressed!